Divisional weekend is upon us and it kicks off in New England Saturday afternoon. Let’s do this. The Patriots will take the field with two of the best offensive players in football in quarterback Tom Brady and tight end Rob Gronkowski. Brady is an expert in distributing the ball to his receivers and when Gronkowski is on his game, he is an unguardable matchup destroyer. New England jumped out of the gate this season and their fast start had fans questioning the possibility of another 16-0 regular season. 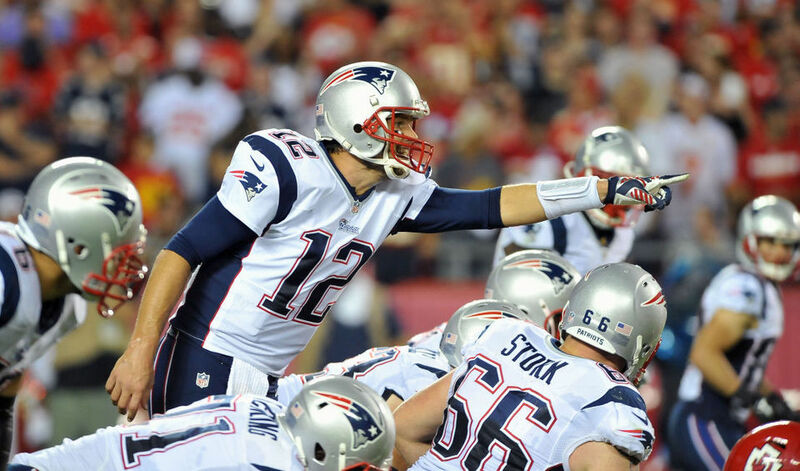 However, injuries to many key offensive players led to trouble to Brady and Co. Despite finishing the season ranked 5th overall in offensive DVOA**, the Patriots rank only 10th in the NFL in weighted offensive DVOA, which is a statistic that gives games from earlier in the season less importance. In a way, it’s a measure of the form that the team is currently in. 10th is good in the context of the entire league. It is much less impressive in the context of playoff teams. Fortunately for New England, that dip in rankings is partly attributable to injuries and wide receiver Julian Edelman is set to return for Saturday’s game. Brady and Belichick love the short passing game, and Edelman’s shifty quickness is incredibly important to that scheme. Depth behind Edelman at wide receiver is sorely lacking in New England and his presence changes the Patriots’ offense more than anyone but Brady or Gronkowski. The bad news for New England is that the running game figures to be non-existent in this game. Running back Dion Lewis was a revelation before a torn ACL ended his breakout season prematurely. None of New England’s other running backs have come close to replicating his contributions in the time since. The other bad news for New England’s offense is that their offensive line is a disaster and they’ll see a defense with two elite pass rushers. Bill Belichick is no doubt aware of this and will presumably attempt to mitigate the pressure supplied by standouts Tamba Hali and Justin Houston by getting the ball out of Tom Brady’s hands quickly. Expect a heavy dose of Julian Edelman slants and screens and quick routes by Rob Gronkowski. The problem for New England’s offense is that Kansas City’s defense may be perfectly set up to stop this sort of attack. Kansas City’s front seven has such an overwhelming matchup advantage against the New England offensive line that they should be able to reliably generate QB pressure by sending only 4 or 5 pass rushers. This leaves plenty of defenders on the second and third levels of their defense, ready to cause trouble for receivers at the line of scrimmage and make quick tackles after short routes. The pass rush will try to make Brady’s Kansas City’s secondary has been one of its strongest points all season. 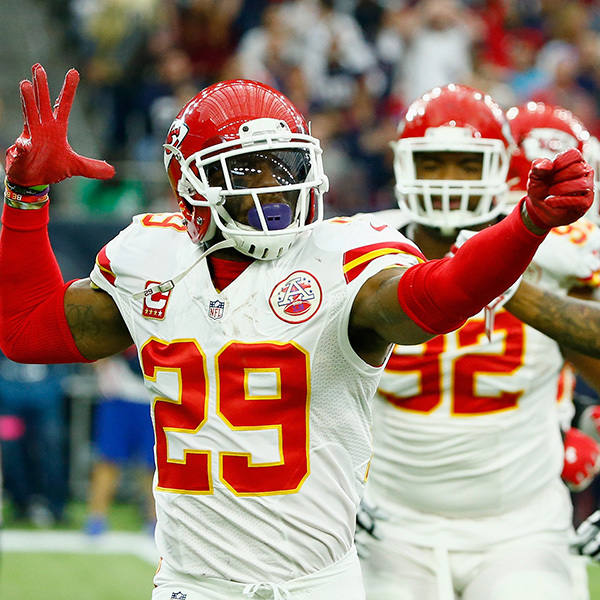 Eric Berry punched cancer in the face and returned to be one of the League’s best safeties. 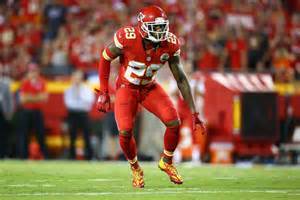 Cornerback and soon-to-be defensive Rookie of the Year Marcus Peters continues to get better. If the Chiefs anticipate a quick passing game, they could match Peters up with Edelman and tell him to press at or near the line of scrimmage. Peters’ size and strength could cause Edelman problems. Against Hali and Houston, every half second counts. Kansas City’s defense has been among the League’s best against tight ends. 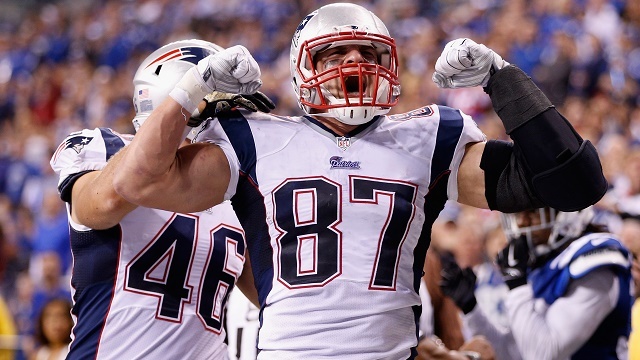 Rob Gronkowski is a transcendent player, so that may not matter. He definitely is that good. The point is that if ever there was a defense that looks like it could slow the Brady-Gronk-Edelman Patriots down, this could be it. New England linebacker Jamie Collins has been outstanding this year, particularly in run support, but the rest of New England’s run defense leaves much to be desired. Despite Collins’ contributions, they rank just 10th in rush defense DVOA. That number pales in comparison to Kansas City’s 1st-placed finish in rush offense DVOA. The Chiefs’ offensive line has been unparalleled at run blocking this year. Andy Reid needs to exploit this one area where his offense has a clear matchup advantage. In the wild card round, Reid was stubborn in sticking to a run-heavy gameplan against the stingier Texans’ defense and he would be wise to stick to the same strategy on Saturday. The importance of Charcandrick West and Spencer Ware’s success as a running back tandem cannot be overstated here. If the Chiefs can run the ball, they can win this game. If they can’t, they’re dead in the water, because their level of success won’t just be reflected in the running game. 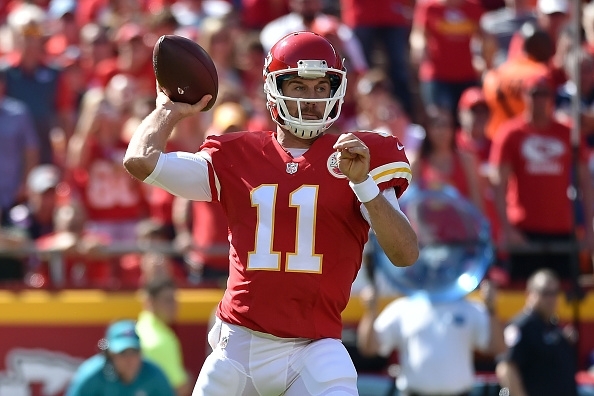 Every NFL Quarterback performs much better from a clean pocket than they do under pressure, but the difference is rarely as stark as it is for Chiefs’ quarterback Alex Smith. Smith’s quarterback rating from a clean pocket this season was a very strong 110.6. When Smith was pressured, that number tumbled all the way down to 57.5. That will be a problem against a very good New England secondary. Malcolm Butler has evolved from anonymous Super Bowl hero to outstanding NFL quarterback in just one season and New England’s safeties have been outstanding all season. New England has the personnel in their secondary to cause real problems for a Kansas City. Wide Receiver Jeremy Maclin is questionable to play and it’s safe to presume that he’ll be something less than 100% should he play. That leaves tight end Travis Kelce as the only receiving target of note on the Chiefs roster and New England will be ready for him. In more bad news for Kansas City, as brilliant as their offensive line has been at run blocking, it has also been almost that bad at pass blocking. That offensive line will be going up against a New England pass rush that ranks 2nd in the NFL in adjusted sack rate. However, much of New England’s pass rush is generated largely by pass rush specialists who don’t regularly feature in their base defense. Chandler Jones, 5 days removed from a really bad synth trip, is the Patriots’ best pass rusher and their only one of note who will see the field on non-obvious passing downs. That brings us back to the importance of the Kansas City running game. If Kansas City can find success on the ground, that keeps Alex Smith out of obvious passing downs. It keeps New England’s blitz packages off the field. It gets him the relief in the pocket he needs to be productive. And, it gives New England’s secondary something to worry about other than Kansas City’s generally underwhelming group of pass catchers. It does everything that Kansas City needs to do to win the game. New England’s defense contains West and Ware. They’re able to generate and Alex Smith once again fails the oft-cited “Can you throw the ball when the defense knows it’s coming?” franchise QB test, leading to seventy-five Sportscenter segments examining whether or not he’s a franchise quarterback. New England doesn’t really bother trying to run the ball, but Belichick creatively schemes to get Julian Edelman the ball in space. Brady and Gronkowski’s greatness is undeniable, even against an undeniably great defense. The Patriots score 27 points, and the Chiefs can’t keep up. Kansas City’s secondary is able to create enough problems for Rob Gronkowski and Julian Edelman at the line of scrimmage to take away the quick passing game. When Belichick tries to adjust to go downfield more often, Tamba Hali and Justin Houston have the extra second that they need to wreak havoc in the pocket for Tom Brady, who never gets comfortable the entire game. Charcandrick West and Spencer Ware follow a very good blocking performance to collectively average 4.5 yards per carry. Andy Reid can pick and choose when he wants to pass the ball instead of leaving Alex Smith vulnerable and mistake-prone in situations where he must pass the ball. Kansas City wins the time of possession battle convincingly and sends the New England crowd home in shock. Kansas City is a really bad matchup for these Patriots, what they’re good at, and what they like to do. The Chiefs are much better at running the ball than the Patriots are at stopping it. The Patriots’ almost non-existant running game is a big problem when their offensive line is as thoroughly outmatched in pass protection as they are in this game. The Chiefs are one of a handful of NFL teams who present the combination of pass rushers and secondary talent that a team would need to slow down this Patriots offense. I can feel in my bones that Kansas City is going to pull the upset in this game. If this Patriots team, this Patriots team exactly, was named anything other than “New England Patriots,” I’d pick the Chiefs without overthinking it. And yet … I’m picking the Patriots. If Kansas City does pull off the upset, I’ll be kicking myself all week for not having the stones to make the call I thought was right. All the same, I just cannot bring myself to pick Alex Smith and Andy Reid over Tom Brady and Bill Belichick in the Playoffs. Patriots win. I don’t think I could be more excited for this game. Is it 4:35 on Saturday yet?